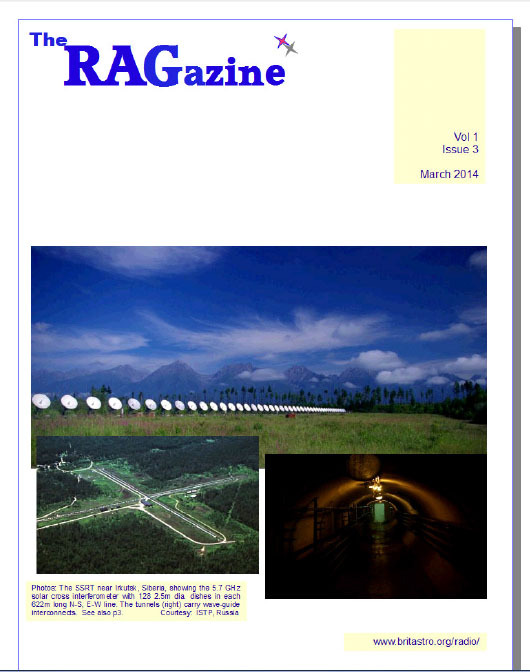 The latest issue of the free BAA-RAG radio astronomy publication RAGazine is now available for download. 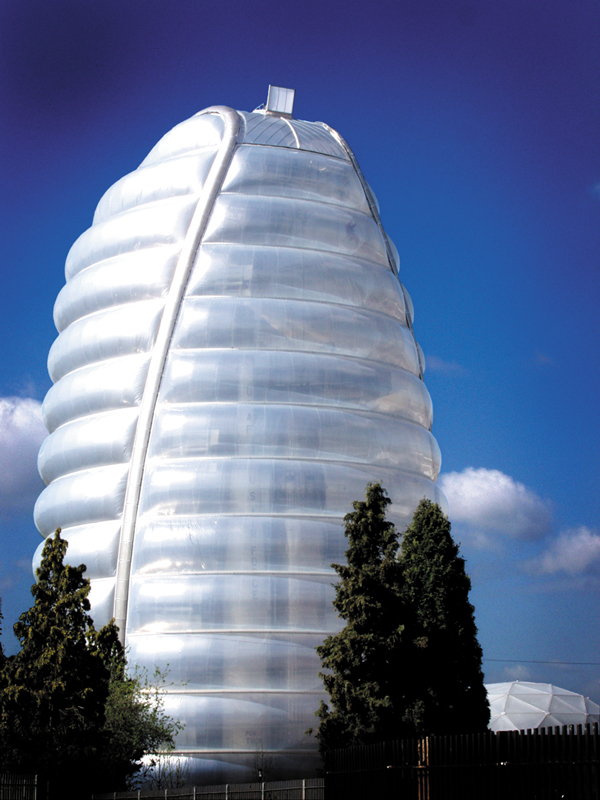 A reminder that BAA RAG is holding this year’s General Meeting at the National Space Centre, Leicester on Saturday, May 17, starting at 10:30. We have two keynote speakers in Prof Paul Cannon (on solar superstorms) and Dr Klaas Wiersema (on Gamma ray Bursts) plus seven supporting talks to create a packed day on radio astronomy and geophysics. Tickets are still available at £15 (£12 for BAA members) which includes free admission to the NSC and free parking. Further information on the event, including details of the presentations, can be found on the BAA RAG website at www.britastro.org/radio/. Bookings can be made by post, phone, fax or email using the Booking Form downloadable from the same website. The 3rd edition of the RAG quarterly newsletter is now available for download from the BAA RAG website (see above). This edition contains Karl Jansky’s 1932 paper identifying additional radio noise to that originating from thunderstorms, a review of the recent book on the life and times of Sir Bernard Lovell, and a description of the Siberian Solar Radio Telescope, along with articles on meteor scatter, magnetometry and VLF activity, plus Tony Abbey’s Technology Watch column. We are always on the look-out for material for RAGazine. The publication is an informal newsletter for sharing information and experiences in amateur radio astronomy and geophysics and we do depend upon input from those reading it. We would like to move to publishing every other month, rather than quarterly, provided we can get a steady supply of material. The Editor (Dave James) is keen to feature members’ home observatories, outreach activities, co-operative ventures and the like. We would also like to find one or two more contributing editors or correspondents for specific areas who can provide regular material on particular areas they feel would be of interest to readers. If you can offer anything here please contact the Editor – dave<at>greenover.net. The Hydrogen Line Observing Group was set up by Gordon Dennis and Brain Coleman to make use of Brian’s 3.7m diameter dish at Redenham Observatory for measuring Hydrogen Line emissions from the Galactic Plane. Despite the high winds earlier in the year which twice damaged the azimuth gear box, observations have been largely completed from Galactic Longitude 20 to 94 degrees with some observations at 108, 110 and 180 degrees. The team is now looking for additional volunteers to extend the survey to at least 120 degrees longitude and maybe to 180 and beyond, plus an increased range of latitudes, in some cases as far as ± 14 degrees to capture all the “structure” detectable with the instrument. Help is also needed to process the resultant data and re-check observations. The project provides you with an opportunity to do some serious observing with a decent size dish. All you need to participate is internet access and the time to set up and monitor individual scans. As an observer you have access to the data collected by the whole Group for your own analysis work.